PILATES! THE PROVEN WAY TO A SLIMMER, STRONGER, MORE CONFIDENT YOU! Pilates, a system of physical fitness developed by Joseph Pilates in the early 20th century, combines body and mind working in harmony to achieve balance and core strength. With this harmony, the practitioner of Pilates achieves precision in the exercises, which carries over into everyday life as grace and economy of movement. 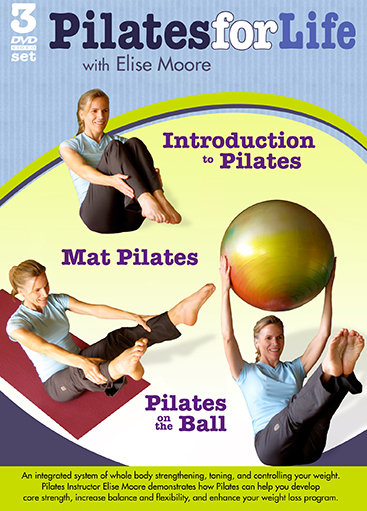 There are seven central principals in the practice of Pilates. Breathing: Properly coordinating the practice of proper breathing with movement. Centering: Developing a strong central powerhouse, or "core," including the torso, spine, abdomen and hips, including spinal alignment. Concentration: Careful attention to one's body, building on fundamental movements and controlled breathing. Control: Eliminating wasted movement with muscle control. Precision: The practice of purposeful, precise exercise that carries over into daily living as graceful and economical movement. Efficiency: A pattern of exercises flowing within and into one another to build strength and stamina. Flexibility: Cultivating and enhancing one's natural state of flexibility. Elise Moore, fitness expert and long-time Pilates Instructor, specializes in helping her students achieve these goals: strengthening and toning, integrating these exercises to help develop core strength, enhance balance and flexibility, even aiding in weight management and weight loss! On each of these three DVDs, Elise will guide you through a complete Pilates workout, from basic exercises to advanced practice, helping you toward a stronger, more flexible, more confident you!